“I think I’ve changed my mind. I don’t think we should do this.” I bit my lip and put my hands in my pockets. “Don’t be nervous. Be proud. This is who we are,” my husband said. He’s used to my last-minute jitters. “What’s the point? Are we trouble-makers? Are we show-offs? I don’t know.” I glanced at the sign on the counter, threw my head back, and sighed. “Come on. Let’s do this.” He headed out the front door. That afternoon I had gone to Clarkston, Georgia with a friend of mine and all our kids to Refuge Coffee Co., the place we adopted during our Family Compassion Focus last year. I chatted with our resettled refugee friends working on the coffee truck, tried a new tea, bought some new mugs, and brought home a sign offered by World Relief Atlanta that said in clear black letters REFUGEES WELCOME HERE. But when I saw the sign in my trunk when we got home my stomach twisted. I have never had a sign in my front yard for any reason. We sometimes fly an American flag, and a “W” flag when the Cubs win, but never anything that could be seen as remotely political or religious (well, the Cubs flag might border on religious). We live in a beautiful, safe suburb, far away from the city of Atlanta and all public transportation. It started as a planned community almost 50 years ago, and affectionately refers to itself as “The Bubble.” It’s known for its golf carts, good schools, and die-hard conservative Republican values. I didn’t see one Clinton sign anywhere in town during election season, but I saw dozens of Trump signs. There were four in my picturesque, tree-lined neighborhood. What would The Bubble think of a sign proclaiming REFUGEES WELCOME HERE? 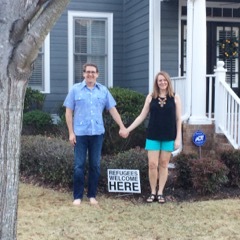 I knelt down, pulled the sign out of the ground, moved it over, and pivoted it to face in between two houses. My stomach flipped again. Our neighborhood’s very active, vocal HOA is not a big fan of individuality. I didn’t want any trouble. My husband helped me up. We stepped out to the sidewalk and stared at the sign. My husband then walked back to it, and shoved the stakes deep down in the ground. We held hands and prayed. We called our son out to take our picture. We posted that picture of us holding hands over the sign on Facebook and Instagram. Friends of our family and and allies of refugees liked, loved, and commented on it. It got more attention than our 20th wedding anniversary picture. It’s just a sign. But it’s also statement.